In this era of globalization, a person with the knowledge of only one language is likely to create hurdles in his day to day operations if he is working with various countries. Hence, it is advisable to have the knowledge of a few other languages as well. But as we are all aware that there are more than a hundred languages in the world and it is not practically possible to learn each of them. Hence, we use various online document translator tools to make our work easier and faster. In this guide, we shall discuss some of the best online document translator tools which are available free of cost. Why Use the Online Document Translator? The document translators are available in two forms, that is online and offline. However, in the offline document translators, there are chances of being obsolete and outdated and they are also needed to be updated regularly. While the online document translators have no such issues and can be easily used without any installation or up-gradation process. Online Translator is one of the best free online document translators which is widely used by millions of users across the world. Although it currently supports only major languages of the World such as English, Kazakh, Spanish, Russian, Chinese, German, French, Arabic, Hindi, Turkish, Hebrew, Greek, etc. You can also use it for translations Icelandic services. But even then, you can quickly get your job done using this document translator if you are not using a remote location language not known worldwide. You can also download this document translator for offline use which is one of its paid features. Apart from being a document translator, this website also allows the users to access various other tools such as Dictionary, Word Forms, etc. which helps learn new words as well as improve quality of the essay. It is effortless to use this online tool as it is very similar to Google Translate. For example, you only need to write or paste the text into the available area. You can either choose the topic manually or leave it so that the system can detect the topic by itself such as Automotive, Business Correspondence, Cinema, Computer & Technology, Gadgets, Music, etc. It can detect the input language itself but it is recommended to select it manually because a lot of languages come from the same family and so they can be mixed. Then, you need to make a choice for the output language and then click on the translate button. The document shall be translated depending on the length of the document and you can copy it as plain text or even download a file in the required format. It is widely used as the best alternative for Google Translate as well. It is among the best tools which are used for translating the entire document at once. Hence, you do not need to type or paste the text here in this tool. You would not find many document translators with a similar feature list as Doc Translator. This tool can translate the documents into 104 different languages without the requirement of any installation or registration. This tool also supports various formats including .rtf, .txt, .str, .pdf, .odp, .odt, .xls, .pptx, .xml, .doc, .docx etc. Therefore you don't need to worry about the format of your document as it can read all of them effectively and efficiently. 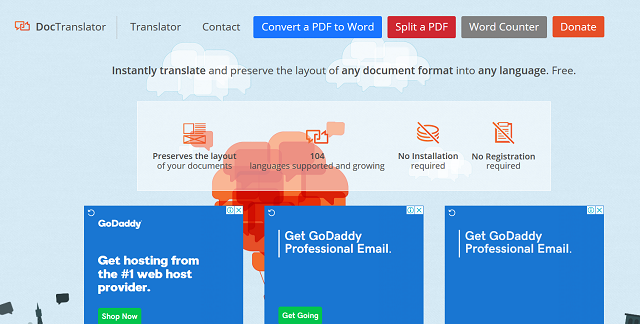 The other tools available with this online doc translator include PDF to Word converter and a word counter. These tools are also essential in a person's day to day life as he deals with a lot of files in these two formats only. Upload the file with the supported formats. This tool will save the formatting of your document and then keep it the same as the original document in the output file. Doc Translator will translate and return the document in the language of your requirement. You can also download the document after it completes the translation process or you can get a copy of the plain text, as required. 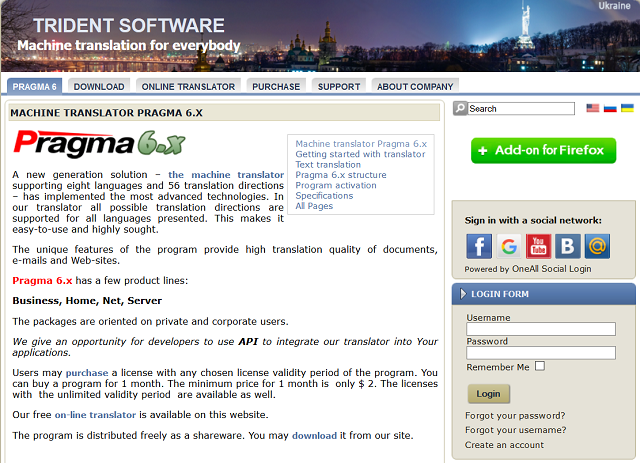 Pragma 6 is another online document translator tool which can be used by the people to translate their document either by typing it or by pasting into the relevant box on the website. Hence we can say that it is somewhat similar to online translator but it is available with support to 56 languages, which is a lot more than the most other document translators available at present. This tool is available for some of the most popular languages of the World such as Russian, English, Dutch, Greek, Danish, Chinese, Hindi, Japanese, etc. It also works similar to the online translator. Therefore, you need to type or paste the text into the given box. Although it can detect the input language by itself, but to avoid any mishap, you should select the input language as well. After you choose the output language and hit the translate button, the translation will appear on the computer screen in a few moments. This makes this online document translator extremely easy to use. These were some of the best and free of cost online document translator tools to be used by the users to translate their documents into a lot of other languages, as per their requirements. However, the grammatical errors might creep in so the users should also give the documents a read manually as well.